V.S. RAMACHANDRAN, a neuroscientist, is Director, Center for Brain and Cognition, University of California, San Diego; Author, A Brief Tour of Human Consciousness, and coauthor, Phantoms in the Brain. [V.S. 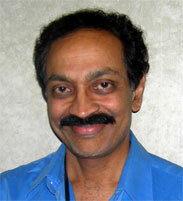 RAMACHANDRAN:] One of the last remaining problems in science is the riddle of consciousness. The human brain—a mere lump of jelly inside your cranial vault—can contemplate the vastness of interstellar space and grapple with concepts such as zero and infinity. Even more remarkably it can ask disquieting questions about the meaning of its own existence. "Who am I" is arguably the most fundamental of all questions. The qualia problem is well known. Assume I am an intellectually highly advanced, color-blind martian. I study your brain and completely figure out down to every last detail what happens in your brain—all the physico-chemical events—when you see red light of wavelength 600 and say "red". You know that my scientific description, although complete from my point of view, leaves out something ineffable and essentially non-communicable, namely your actual experience of redness. There is no way you can communicate the ineffable quality of redness to me short of hooking up your brain directly to mine without air waves intervening (Bill Hirstein and I call this the qualia-cable; it will work only if my color blindness is caused by missing receptor pigments in my eye, with brain circuitry for color being intact.) We can define qualia as that aspect of your experience that is left out by me—the color-blind Martian. I believe this problem will never be solved or will turn out (from an empirical standpoint) to be a pseudo-problem. Qualia and so-called "purely physical" events may be like two sides of a Moebius strip that look utterly different from our ant-like perspective but are in reality a single surface. To account for some of these syndromes we need to invoke mirror neurons discovered by Giacomo Rizzolatti, Victorio Gallase and Marco Iacoboni . Neurons in the prefrontal cortex send out sophisticated signals down the spinal cord that orchestrate skilled and semi-skilled movements such as putting food in your mouth, pulling a lever, pushing a button, etc. These are "ordinary" motor command neurons but some of them, known as mirror neurons, also fire when you merely watch another person perform a similar act. It's as if the neuron (more strictly the network of which the neuron is part) was using the visual input to do a sort of "virtual reality simulation" of the other persons actions—allowing you to empathize with her and view the world from her point of view.